Here it is, 3 weeks since I've posted the details of my food and weight. And, although I know what I've been going through, mentally, I can't really find a way to express it. But I've decided to sit down this morning and start to try and reflect. At least I'll try my best! I still keep my food journal everyday. I don't find myself snacking in between meals. I'm able to eat smaller portions and be satisfied, in fact I prefer it most times. I don't have the desire to over-exercise as much as I used to. I'm not afraid to eat out, although (IMO), I never have a reason to. I've realized that I'm taking responsiblity in my choices, about food and eating, in different ways. Although my food journal is not as detailed about my food as it used to be, it has become more detailed about my life, like I thought it might, it's become more of a personal journal. It's a place that I write down inspirational thoughts as well as weight and calories. Somedays, however, I don't journal every morsel that goes into my mouth, but I generalize. It's still an important part of staying in touch with my food choices. My daily menu is 99% of the time the same, 1 raw salad meal (this can include fresh fruit), 1 cooked veg meal (this may include a carb, like beans, pasta, etc) , 1 yogurt/fiber meal, and PNB (fat) w/celery. I still think it's important (for me) to have a high calorie day, but hope to get more control over it. I've been more inspired to expand my personal menu options lately, especially this past spring and summer season with so may fresh fruit and veg options. I don't find myself having the desire to snack. My body feels best eating all of my meals within 6-7 hours of eachother, which means that I don't eat for 12-14 hours (ideally). It makes digestion easier for my body, at least that's how I feel. Eating less also makes my body feel good, so I finally feel as if I've reached the point of feeding my body and not my emotions (most of the time!). Feeling good physically connects with feeling good mentally and feeling good and feeling my best is the goal! 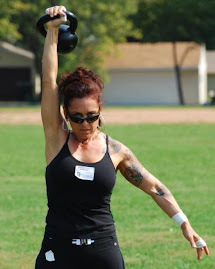 My kettlebell training always takes priority. And after my experience with overtraining it (kb's)last week I can see (and feel) the importance of staying rested and nourished. Walking, I love! I hope I never stop walking. It feels natural, healthy and it gives me time to think and reflect as well as connecting with my body in the most basic way. Yoga is also essential because it forces me to take the time to stretch. Until I can force myself to do it on my own, more regularly, at home, 3 times a week, minimum, is ideal. Because I feel more in "portion control" than ever, (I'm actually capable of eating "single servings"! ), not 100% of the time but more times than not, and that combined with a lesser desire to snack I don't feel the need to have "emergency food" on my person at all times (like an apple). I almost always do, however, out of habit, but I can stop somewhere and pick up a little something if I need to, although it's rare, my point is that my anxiety about it is much less. Taking responsibility. It occurred to me the other day, when I chose to stop eating, before getting to the point of overeating, that I was taking responsibility in a new way. I've always felt that everyone knows how to lose weight, what's missing is motivation (to take control and reponsibility), not knowledge. The same is true with weight maintenance. At this point, ( in my journey) I know how many calories are in the foods I eat, so I have to take responsibility and stop eating at the point of knowing that I've had enough (calorically). That I know. And to not do that (stop at that point) would be to choose to not feel my best. And I chose to feel my best and be my best. "I've always felt that everyone knows how to lose weight, what's missing is motivation (to take control and reponsibility), not knowledge." WORD. Truer words were never spoken. Or, as my motto has become "less whining, more doing." Very nice post Tracy. While it is true that lots of people have the knowledge about what to do, the FEAR/ANXIETY about 'breaking up' with food as their major relationship is a pretty big deal for a lot of people. In other words, if it was easy, everyone would do it. I'm glad for you it's getting easier. You are an inspiration. Christine, Speaking of "doing", are you taking your own advice, lol? "Breaking up with food", I love it!!!! I'm currently on an "All Butter and Beer" diet. It's the latest thing. I'll keep you posted. Found you thru Leslie's blog... So glad I did! I love this post about taking responsibility for eating and taking responsibility for your LIFE. You're so right - life is good. And it is better when you are your best. Thank you for some very inspiring posts!